BBC Radio 2 has announced major changes to its schedules this year, with a new sound to Drivetime, new slots for specialist shows and a live overnight show. 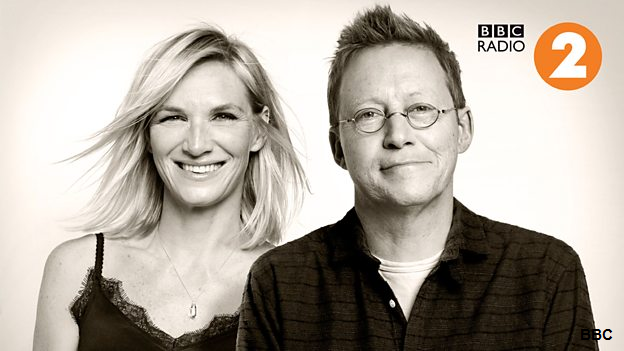 Simon Mayo and Jo Whiley (pictured above) are joining forces in a new partnership for Radio 2's new early evening show which will kick off on Monday 14th May from 5pm-8pm. Friday's programme will remain as All Request Friday from 5pm-7pm, and Tony Blackburn's The Golden Hour remains from 7pm-8pm. Meanwhile Sara Cox will front a brand new live show from 10pm to midnight from Monday 14th May. Sounds Of The 80s will remain on Friday nights (10pm to midnight) and from Friday 18th May, the show will be hosted by Gary Davies. The programme will continue to feature the very best music from the 1980s: hits, classics, album tracks, 12” singles and rarities, plus interviews with stars from music, film and television from the 80s. The monthly BBC Red Button specials will continue, featuring the decade’s most entertaining videos and new, star interviews. Also from the week commencing 14th May, Radio 2 will launch a new live overnight show with OJ Borg to be broadcast from Salford each Monday to Friday, 12am-3am. In line with the other schedule changes, the weekly Blues, Jazz, Folk and Country specialist music shows will move one hour later to 8pm-9pm, every Monday to Thursday. In other changes, Huey Morgan’s Saturday morning show will now be extended from 4am-6am. Ana Matronic’s Disco Devotion, broadcast each Sunday morning from 12am to 2am will now spread its wings to become Ana Matronic’s Dance Devotion, and will encompass all forms of dance music. Early Sunday mornings will have a new sound with Angela Scanlon on Sunday from 4am-6am. Long running shows will be axed from the schedule: these include The Organist Entertains (Tuesday 11pm-11.30pm), presented by Nigel Ogden; Listen To The Band (Tuesday 11.30-midnight) and the Radio 2 Arts Show (Thursday 10pm-midnight). A number of Radio 2 shows will be repeated during the night: these include Trevor Nelson’s Rhythm Nation, Claudia Winkleman’s weekend show, Sounds Of The 60s, Sounds Of The 70s, Sounds Of The 80s, Pick Of The Pops with Paul Gambaccini, and Craig Charles’ House Party, Monday to Friday, between 3am and 5am, and Saturday & Sunday between 2am-4am.